Inspired to become a lawyer by her grandfather, who spent years representing immigrant farmers and workers after retiring from the army post-World War II, Sue Lewis Robinson obtained her J.D. from the University of Pennsylvania Law School in 1978 and began her career in private practice in Wilmington, Delaware. Judge Robinson later joined the U.S. Attorney’s office in Delaware as an Assistant United States Attorney, and became a magistrate judge on the U.S. District Court for the District of Delaware—currently the hottest patent venue in the country—before being nominated to a seat on that court by President George H.W. Bush in 1991. 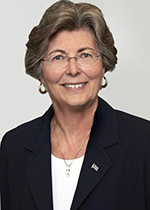 She was the first woman to serve as chief judge on the court (from 2000 – 2007), issued over 3,000 decisions during her 25-year tenure, and is responsible for devising some of the best rules in the country for streamlining patent cases. Judge Robinson retired from the court earlier this year, and recently joined Farnan LLP, where she is focusing on complex civil litigation, and plans to use her judicial expertise to handle arbitrations and mediations. As the winner of the 2017 IPO Education Foundation Distinguished IP Professional Award, Judge Robinson will be honored on 5 December during the 2017 Foundation Awards Dinner. She spoke with Innovator Insights about her experiences as a judge in one of the busiest courts in the country for patent cases and shared some of the insights she has gained during her impressive career. What has the transition back to private practice been like so far? I’m only three months out, but it has been really interesting. I always expected there was a lot going on behind the scenes that judges never get to know when they’re making their decisions. I’m finding out just how much I missed. It’s hard [as a judge] to apply common sense to issues when you’re only getting about 30 percent of the story. How does the workload compare? There was a moment in time once I was on the court where we had 300 patent cases per judge. When I left the bench, there was this steady, sometimes overwhelming, flow of motions and trials. In private practice, of course, you have to generate your own workload, so It’s a real change. When did you get your first patent case as a judge? It wasn’t until I became a magistrate judge in 1988 that I was given my first exposure to patent cases, mostly when discovery disputes were referred to me. Once I got to the bench it was around the mid to late 1990s before our patent docket really took off—and soon became a steady diet. Are there particular patent cases from those early days on the court that you found educational or memorable? I was lucky—back in the day, we had a lot of medical device and mechanical patents, which are easier I think to digest and to apply to your legal framework than some of the complex software and biochemistry cases that came later on. I got the first stent case in 1997, and I think the last order I issued that related to a stent was to approve a settlement 10 years later. The wonderful thing was that I started out with the first stents and, over the course of the next decade, I saw how that single invention evolved to different materials and improvements, such as drug-eluting stents. It has always been so satisfying and thrilling to see cutting-edge technology evolve as the patent cases and litigation reflect that evolution. What has changed the most since those early cases? At the outset of my career, you had one or two patents, two competitors, and technology that—even if complex—you could see its application to real life in a fairly visible way. As the years have gone on, we’ve seen cases that got more complex from the standpoint of number of patents and claims asserted at once and the technology got more difficult. For example, you might have a software invention that claims one circuit in a large device. That kind of technology is not only difficult, but a little less understandable to a jury I think. Of course, now we’re not only seeing inventions involving recombinant DNA, but biosimilars, which is even more complex. So, not only did the litigation get more complex, but certainly the technology has also. What were some of the major challenges you faced during your time as chief judge? With the resources the court has at the moment, it’s going to be very difficult to keep up even with the caseload it already has and the relatively modest increase it has seen so far since TC Heartland. As a chief judge in a small court, we didn’t get extra resources like in larger courts, where they get extra law clerks and reduced caseloads. So, I had an ever-increasing docket along with the extra administrative duties that come with being a chief judge. Also, when I was chief judge in 2000 – 2007, the court was—believe it or not—just transitioning to an electronic docket. Going through that transition was certainly my biggest challenge. What were the biggest challenges of being a trial judge? As a judge, our docket was ever increasing. The nice thing about being in Delaware, where we don’t have local rules, was that I could really experiment with the process to try to make especially the patent cases move forward in an efficient way that was consistent with my strengths and weaknesses. I always enjoyed tweaking the process to make it fair, but as efficient as I could make it. You announced in 2014 a major overhaul of your scheduling order for patent cases—would you consider that one of your greatest achievements during your time on the court? I guess I would consider that an achievement, but I think my greatest achievement was just keeping up with the law and the technology. I thought if I retired with my reputation and health intact, I would be satisfied with my career. What was the average caseload you were dealing with as a judge on the court? Before I came on to the court, judges had 10-20 patent cases each, which was still high compared to rest of country at the time. There was a moment in time once I was on the court where we had 300 patent cases per judge. Some of those were the same case with different defendants, but we certainly had scores of patent cases on our docket. I scheduled trial at the outset, so I always had a calendar that reflected cases two or more years out. How did the changes that came with the America Invents Act (AIA) affect your job as a judge? While overall it has had good results, I thought it just made my job more difficult. In terms of the fact that now you have parallel proceedings occurring in the courts and at the USPTO, I just saw lots of room for mischief. Also, making plaintiffs file 20 cases [instead of allowing them to join multiple defendants in one case] doesn’t seem helpful. I still processed them the same way in terms of coordinated discovery, and so few cases actually got to trial. So I’m not sure what it accomplished in that regard. I’m generally someone who thinks issues aren’t helped on a high level by congressional intervention—at least in the judiciary. Does that mean you think the courts should be left to solve the current problems around patent litigation on their own, without changes to the law? Well, with respect to this wave of software patents that issued after the turn of the century and that are still being litigated, we probably needed Congress to step in and focus the judiciary’s attention, because we’re generally slow to react on issues like that. On the other hand, compare that to what Congress has tried to do with biosimilars, where they established at the outset a detailed, step-by-step process that—at least today—no one seems to be following anyway. Congress should realize what judges have a long time ago: that no matter what rules you put in place, smart lawyers will get around them, which will then present new challenges, even if you think you’ve solved the old ones. How do you think the court will fare in the wake of the TC Heartland decision? Certainly, with the resources the court has at the moment, it’s going to be very difficult to keep up even with the caseload it already has and the relatively modest increase it has seen so far since TC Heartland. With sufficient resources, which is a full complement of four active judges and three magistrate judges, it strikes me that the court should be able to keep up—especially if the parallel proceedings under the AIA work to help discard certain patents that swelled the docket in the first place. What were some of the mistakes lawyers made that you would advise against as a retired judge? Congress should realize what judges have a long time ago: that no matter what rules you put in place, smart lawyers will get around them. As a general rule, judges hate to have their time wasted—especially in courts with limited resources. When lawyers mis-cite the record or mis-cite case law, it just makes more work for the judge, because once you have one mis-cite, you tend to check everything—you can’t take the lawyer’s word for it. Also, it’s not helpful when lawyers don’t prioritize arguments, but instead just throw everything at a judge so that the judge doesn’t really know which point is most important and critical to the lawyer’s case. If you can make a judge’s pathway clearer in terms of what’s important to you, and do it in a way that’s not only persuasive, but accurate, that’s ideal. Anything less than that is not the best lawyering. Also, because I’m a pretty conservative, quiet person, lawyers who came in and overdramatized didn’t really appeal to me, but that’s a really personal pet peeve. What did you find most helpful as a judge with respect to lawyers’ brief writing, arguments, or amicus brief? I’m sure lawyers have heard the same thing from judges in many different settings, but the practice lawyers really need to address is to take on the weakest points in terms of anticipating what opposing counsel will be saying. Take it on and address it as best you can. Don’t run away from it, because it’s not going anywhere. It’s helpful to a judge, not only in terms of a lawyer’s credibility, but also in terms of intellectualizing the big picture. Everyone’s going to have strengths and weaknesses, and you have to address the weaknesses as well as prioritize your strengths. What does winning the Distinguished IP Professional Award mean to you? I’m so honored by this award and to be included in something called Innovator Insights—it’s the lawyers who were bringing me the innovation and I was just trying to come to decisions as best I could. I’m humbled by the entire experience.